The following video is part of a film called “Blue Angels: Around the World at the Speed of Sound”, realized to support the Blue Angels 1992 season. The story behind it is very interesting and it is worth to be told. Generally speaking, air shows across the world to represent the United States are flown by the USAF Air Demonstration Squadron, the Thunderbirds. 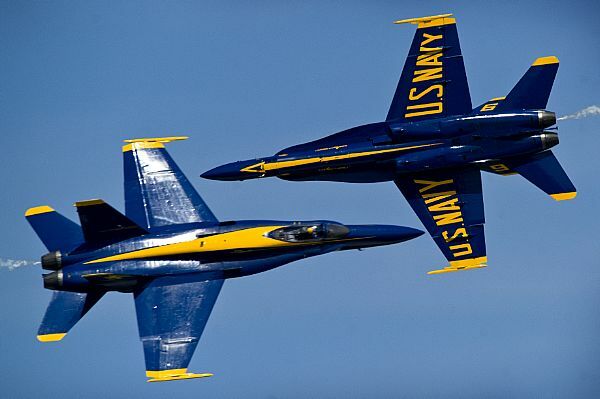 But in 1992 it was the US Navy Flight Demonstration Squadron, the Blue Angels, that flew overseas for a series of air shows which included the first U.S. military presence in the skies over Moscow after the end of the cold war. Obtaining the approval to go overseas was a hard thing for the Blue Angels Commanding Officer, Greg Wooldridge, who took command of the team in November 1990. The team’s three main tasks are: to improve community relations, to enhance the morale of the folks already wearing the US Navy uniform and, the most important of all, to enhance recruiting in the Navy. Since the Blue Angels mission is strictly linked to the Navy’s recruiting command, the team flight activity is mainly scheduled across the United States where there is more chance to improve recruitment. However the 1992 tour saw the Blue Angels to perform in Russia, Bulgaria, Romania, England, Spain, Italy, Finland and Sweden: eight different countries in one month, in the first European tour in 19 years. Since this trip would have brought not only the team, but also the United States military services in several former Soviet Block countries for the first time, during winter training, Woodbridge thought to go to Hollywood to find a producer to realize a film which should have had to support the Blue Angels tour. He found Rob Stone who had just started his production company and since Woodbridge had no money for this kind of project, he told Stone that he would have to get his own funding to produce the documentary. Stone and two of his guys went to the Blue Angels winter training and they filmed a movie hosted by the Hollywood star Dennis Quaid which is called “Blue Angels: Around the World at the Speed of Sound” which was showed across the United States for almost two years and then sold to the Discovery and History Channel. Stone did a great job with this film since it gave to the Blue Angels some extra exposure enhancing Navy recruiting. Once they were in the former Soviet Union, the Blue Angels pilots were given the opportunity to fly with one of the Russian frontline fighters, the Su-27 Flanker of the Russian Knights or the MiG-29 Fulcrum of the Swift, the two Russian demonstration teams, while the American pilots hosted the former Soviet pilots in the two seat Blue Angel F-18 Hornet. The tour in the former Soviet Union was a huge success for the Blue Angels, the first foreign flight demonstration team to perform there: they flew a modified air show in Moscow Day to honor the anniversary of the birth of the city and Woodbridge discovered that from west to east, people loved them. Noteworthy, mixed formations, including Blue Angels F-18 and Russian Su-27 and Mig-29 jets were flown during the Russian tour. David Cenciotti has contributed to this post.